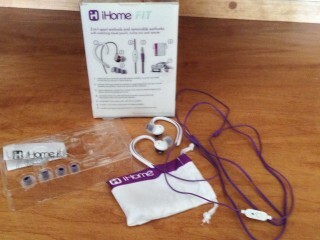 The iHome Fitness Innovation Technology, FIT, is a line of audio products for active use or while lounging on your sofa. The iB11 2-in-1 sport ear buds that I reviewed are on the lower end of the line which made me curious about the higher end ear buds. 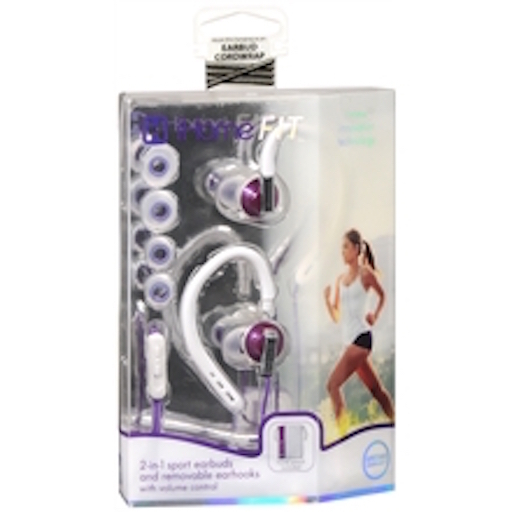 The iB11 sport ear buds are assembled with ear hooks providing a secure fit while exercising. The ear hooks can be detached for less active listening. The ear buds are labeled “L” and “R” and should be inserted in the left and right ear respectively to ensure proper fit and best sound. The detachable ear cushions are easy to clean and fit a variety of ear sizes. The iB11 2-in-1 sport ear buds has a 48” cable with a 3.5mm stereo plug and in-line volume control that allows adjustments to listening levels. A travel pouch is also provided for ease of portability. In addition, the packaging hang-tag is designed to be used as a earbud cord wrap, keeping the cord tangle-free. Enough with the features, you say? How do they sound? Pretty good for the price. The dynamic sound with enhanced bass is not as deep as I prefer for music enjoyment but fine for voice audio. However, with the ear cushions installed, they have excellent noise-cancellation ability. I was not really impressed with the in-line volume control, finding it difficult to adjust the sound levels. During exercise, the iB11 2-in-1 sport ear buds fit perfectly in my ear with the ear cushions attached. However, they became uncomfortable after extended use. Removing the ear cushions resolved that problem. For the $24.99 price the iB11 2-in-1 sport ear buds provide decent sound quality. The in-line volume control would need to be addressed for me to even consider giving up my Apple EarPod which functions as a remote and microphone with excellent volume control for $29.99. The iHome FIT lline has a number of different audio products at graduated price ranges that may address these issues. However, iB11 2-in-1 sport ear buds functions well as an entry-level audio device.